More than 150 injured veterans and their supporters will set off Sunday, Sept. 7, on the UnitedHealthcare Ride 2 Recovery Minuteman Challenge, a six-day, 355-mile bicycle ride from Waltham, Mass., to New York City. Mike Frazier gets a helping hand from Ray Clark as they tackle a hill together on the Ride 2 Recovery Challenge. These injured veterans are using cycling as part of their physical and mental rehabilitation from injuries and illness suffered in service to the country. In the upcoming UnitedHealthcare Ride 2 Recovery Minuteman Challenge, cyclists will be riding hand cycles, recumbents, tandems and traditional road bikes (Photo: Tiffini Skuce, Ride 2 Recovery). Minuteman Challenge cyclists will start their journey in downtown Waltham and ride through New England and New York with overnight stops in Providence, R.I.; Hartford and Danbury, Conn.; Newburgh, N.Y.; and Fort Lee, N.J. Highlights of the ride include a visit to Gillette Stadium on Sept. 7; a ceremony at the Rhode Island State House in Providence and an afternoon celebration in downtown Hartford on Sept. 8; a private screening of the film “Rebirth” on Sept. 9; a stop at West Point on Sept. 11; and a breakfast at Macy’s Herald Square and a visit to the 9-11 Memorial Museum on Sept. 12. The USO Canteen will travel with the cyclists to provide lunch stops each day. To see the daily stops and events along the route, or to sign up for the Minuteman Challenge, visit UnitedHealthcare Ride 2 Recovery Minuteman Challenge. Ride 2 Recovery supports physical and psychological rehabilitation programs for injured veterans, featuring cycling as the core activity. From indoor spinning training at military installations to multiday, long-distance rides, Ride 2 Recovery helps injured veterans heal through the challenge of cycling long distances using hand cycles, recumbents, tandems and traditional road bikes. This is the fifth year that UnitedHealthcare is serving as Ride 2 Recovery’s presenting sponsor, providing financial, in-kind and volunteer support to assist in the rehabilitation of America’s injured veterans. This year, UnitedHealthcare is the presenting sponsor of six Ride 2 Recovery cycling challenges across the United States and in Normandy, France. Ride 2 Recovery is one of many ways UnitedHealth Group supports veterans and their families. UnitedHealth Group is a member of the 100,000 Jobs Mission, a coalition of major U.S. corporations that share the goal of hiring 100,000 transitioning service members and military veterans by 2020, a goal that has already been exceeded. UnitedHealth Group partners with a variety of organizations to help source military and veteran candidates such as the Military Spouse Employment Partnership, RecruitMilitary and the Wounded Warrior Project. Last year, UnitedHealthcare became the managed care support contractor for the West Region of the U.S. Defense Department’s TRICARE program, serving nearly 2.9 million military service members, retirees and their families in 21 states. Ride 2 Recovery supports physical and psychological rehabilitation programs for injured veterans, featuring cycling as the core activity. 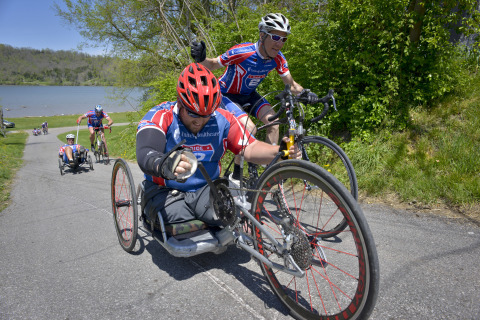 From outdoor training at military installations to multiday, long-distance rides, Ride 2 Recovery helps injured veterans heal through the challenge of cycling using custom adapted bicycles, hand cycles, recumbents, tandems and traditional road bikes.